Today, BitFenix is pleased to announce a new lineup of products for users wanting to upgrade their systems to the new USB 3.0 standard. With the new BitFenix USB 3.0 Front Panel and the BitFenix Internal USB 3.0 Adapter, PC enthusiasts now have added flexibility for adding and upgrading their systems to USB 3.0. "The proliferation of USB 3.0 devices is only going to increase, and after listening to the demands of our users, we’ve come up with a new line of accessories to help people get their systems up to speed quickly and easily," says BitFenix Product Manager David Jarlestedt. The BitFenix USB 3.0 Front Panel fits into any external 3.5" drive bay and provides an easy way for users to add four USB 3.0 ports to their systems. This accessory is compatible with latest-generation USB 3.0 motherboards that have internal 20-pin USB 3.0 headers, and allows users to add up to four USB 3.0 ports to their chassis without unsightly wiring. On the front is a luxurious brushed aluminum bezel that fits handsomely with a large variety of cases on the market, and best of all, the BitFenix USB 3.0 Front Panel installs quickly and easily. 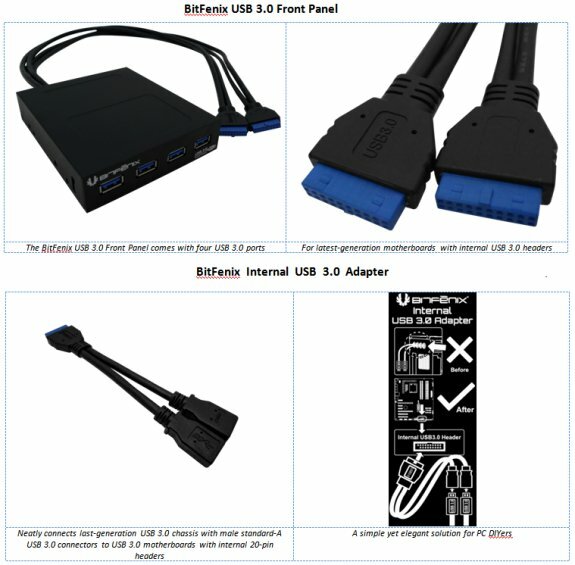 The BitFenix Internal USB 3.0 Adapter solves a common PC DIYer's problem of neatly connecting previous-generation USB 3.0 chassis that have male standard-A USB 3.0 connectors to their USB 3.0 motherboard with internal 20-pin USB 3.0 headers. This handy accessory allows users to connect their USB 3.0 cables from the inside of the PC chassis -- no more having to run cables from the back of the motherboard through the outside of the case to enable USB 3.0 ports. With precision molded connectors and quality construction, this simple accessory elegantly keeps your system neat and tidy. The BitFenix USB 3.0 Front Panel will be available towards the end of July 2011 with an estimated MSRP of 19.90€ (incl. 19% VAT) and $24.90. The BitFenix Internal USB 3.0 Adapter will be available at the same time with an estimated MSRP of 7.90€ (incl. 19% VAT) and $9.90.